One of the nice things about having kept a blog for multiple years is that you can go back to the same time for previous years to see what was happening back then, or to find out when a particular sighting occurred. I was curious about the timing of the wildflowers for the last couple of years, given how delayed things have been this year due to the cold. Last year, the very first of the Dutchman’s Breeches were just starting to bloom on April 8. The year before that, 2009, I first noticed them on April 17; but nearly every plant was in full bloom by that time, so the first one had probably opened a week earlier – which would work out to roughly the same timing. With those dates in mind, I visited the spot in our woods here where we have a large concentration of the plants, to see how they were coming along. I expected that everything was going to be slow, so I wasn’t surprised to see that the plants were still small, just beginning to unfurl their leaves, when I looked on April 8. A while yet before they’ll be blooming. Still, I was pleased to see them coming up; I’d been there a week earlier to look and had found nothing yet. It’s interesting that the early leaves are tinged in red, when the mature plant is fully green (albeit with reddish stems). Turns out this has an adaptive function. The red colour is due to the presence of anthocyanins, the same pigment found in red autumn leaves. The pigments serve as a sort of sunscreen for these young and sensitive leaves, protecting them from burning. Not surprisingly, perhaps, this trait is most often seen in plants that spend much or most of their life in the shade. For spring ephemerals like the Dutchman’s Breeches, the early spring sunlight, before the leaves have appeared on the trees to shade the forest floor, is relatively strong. As the leaves grow and mature, and become gradually hardier, the red pigments are slowly lost, allowing the leaves to acclimate to the light of the sun. There have been a few scientific studies testing this hypothesis. As someone who went through school for science and, with much relief, abandoned academia, I often find the cumbersome technicality of scientific language such as this amusing: “[The presence of anthocyanins] may compensate for a low capacity in the xanthophyll cycle-dependent harmless dissipation of excess excitation energy.” Or, you know, the inability of the leaves to handle extra sunlight without burning. They haven’t worked up their tan yet. I’ll close with a couple of photos of the dogs. As regular readers of the blog will know, I like to pose Raven next to things for a scale reference. 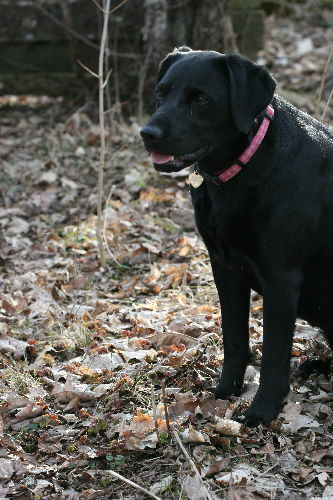 At two-and-a-half years old, she’s well-trained and obedient, quiet and patient (usually. Unless water or chipmunks are involved). Jack, however, is still just learning. Patience is not his strong suite. So I get in a bit of practice where I can. We’re getting there. The plants are (were) still so small that you can barely even notice them in Raven’s photo, but Jack’s still small enough to make a better scale reference. This was a great post….Thanks. I am also waiting on the flowers. Bloodroot is just peaking through the ground here in Northern Michigan. Fascinating – re: the red colour. The leaves of many shrubs come out reddish at first. I suppose the same thing is at work? 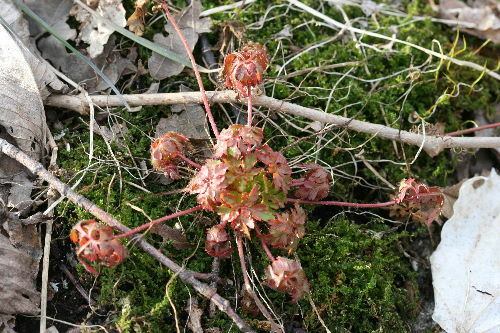 However, I can think of quite a few shrubs that grow in full sun that have reddish young leaves. How do the dogs get along with one another? Thanks for the explanation of the presence of anthocyanins. It’s interesting how life adapts in a harmful environment. It was nice to meet you today at bird banding – I decided to check out your blog here in more depth and it’s beautiful! I love all the pictures and I’m sure I’ll learn a lot from reading it. 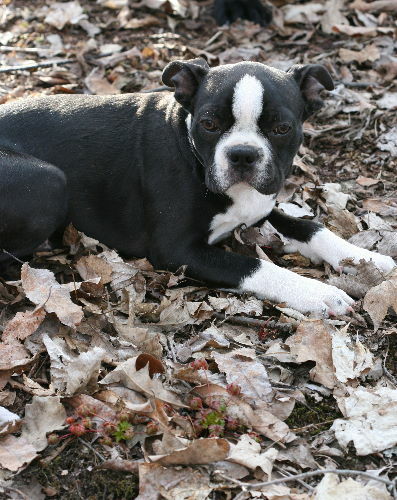 I also love to keep track of what flowers come up in the spring – something that my dog and I do daily too! 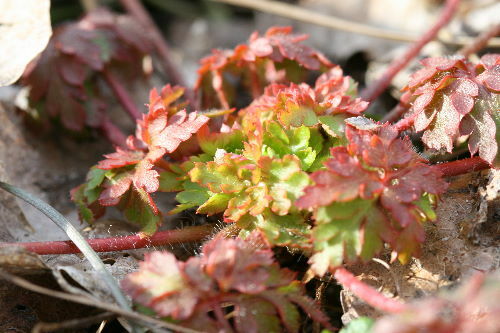 The plants pictured here look a lot like the Herb Robert (Geranium robertianum) that grows in the woods by my house. They also start out reddish – I guess for the same reason.